I hadn't really planned on cooking anything from my cookbooks this weekend, which put me in a bit of a pickle, not having purchased my protein of choice in advance. About 95% of the recipes in the queue involve beef or pork, and I don't want to make those dishes with anything other than Blood Farm meat. Since I wasn't going to make it to Blood Farm this weekend, and since they don't sell whole chickens at Blood Farm anyway, I decided I would go with the one dish in my queue that uses a whole chicken: Coq au Vin. 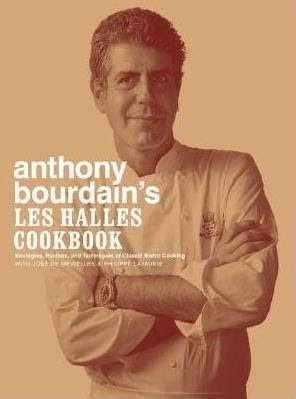 I imagine there are at least 15 versions of this dish in the books on my shelf, but I decided to start with Anthony Bourdain's recipe from the Les Halles Cookbook. Why did I choose this version? I can't honestly say. I bought this book when it first came out, and I enjoyed reading through it (the author's voice is uniquely present even in the recipe instructions) but had never actually tried to cook out of it before. This seemed like as good a time as any, I guess. I'd never made a traditional Coq au Vin before, only Eric Ripert's Coq au Vin with Coconut Milk (which rocks), so this was a chance to see what the classic is all about. The first step is to get the bird and some herbs and veggies soaking in red wine overnight. but that's obviously not enough to cover the ingredients, so I decided to chuck everything into a freezer bag instead. The odd thing about this recipe is that Bourdain wants you to leave the chicken whole until after it is cooked, which would mean that it doesn't ever get fully submerged in the liquid while it cooks. This isn't even an oven braise, it's a stovetop simmer... so un-submerged chicken means uncooked chicken. It's not like he just forgets to tell you to cut up the chicken, either, because he does tell you to cut it into four pieces once it's done cooking. Weird. Maybe he's just used to doing this in huge batches and never tested it with the scaled-down recipe? I have no idea. I checked with several other Coq au Vin recipes (including Julia's), and everyone else cuts up the chicken before cooking. I decided to compromise and just cut the chicken into three pieces (two leg+thigh pieces and a double-breast) instead of the standard 8, and saved the back and wings to throw in during the cooking process. After marinating overnight, the chicken, marinade, and veggies are separated. then set aside while the veggies are sautéed until soft. When the veggies are soft, the chicken, wine marinade, and bouquet garni (which I didn't bother to tie because I was dealing with massive basement flood at the time) are added back to the pot. and big ol' batons of bacon. and a tablespoon of the rendered fat is used to cook the mushrooms until nicely browned. The onions are a bit fussier. They start off in a pot with a pinch of suger, a pinch of salt, butter, and just enough water to cover. and the mixture is allowed to simmer until the liquid is mostly gone. The onions are removed from the pan and a cup of wine is added, then reduced to a syrup. With that, the garnishes are ready to go. Meanwhile, the chicken has finished cooking. It is removed from the wine mixture (with the double-breast then halved), and is still quite purple... The sauce is strained at this point. The recipe says to strain it straight into the reduced wine, but there was a lot of fat on top (almost 1/2 cup, as you can see below), so I decided to de-fat first. Plating time was almost here. The garnishes are added into the wine mixture, and that sauce is poured over your purple chicken. So... Yeah. This was fine. Not mind-blowing, and not something I'm now obsessed with or anything... but good. It's hard to judge the written recipe too much based on my end result, since I went off-recipe several times. Some of those (like cutting up the chicken) were because the recipe was stupid. Others (like the fact that I refrigerated the cooked chicken and garnishes overnight then rewarmed the next night to finish the recipe... which is normally a good idea with braises, anyway) were due to my rapidly flooding basement. Honestly, I think these classic, rustic dishes aren't really my cup of tea in general, since I'm a person who prefers strong, aggressive flavors. So, while this was probably a good version of Coq au Vin, I'm not sure any version of Coq au Vin would be something I found transcendent. That being said, it was hearty and satisfying, and I did enjoy my dinner. The recipe, on the other hand, didn't exactly make me eager to return to this book for more. I feel like Bourdain probably needed to invest more energy in testing the recipes and less energy in trying to sound witty/snarky. I enjoyed the snark while just reading through this book the first time, but when you see that it's next to mystifying/stupid instructions while you're cooking, it tends to seem more annoying than anything. Whatever. Not a total failure, but nothing I'm likely to make again any time soon.